Double Dark Chocolate Mousse Pie. Vegan! Chocolate Craving. OK, don't judge, but I'm actually not a huge chocolate fan. I'm more a vanilla bean girl. But my husband loves chocolate. Dark chocolate. The darker, the better. Milk chocolate won't do it for him. He likes the 80% cocoa bars. 90% is even better. For Thanksgiving he wanted a chocolate dessert. So in honor of his request for a vegan chocolate dessert, "something like a flourless cake" (you know the non-vegan totally sinful kind at fancy restaurants) - I decided to craft him a dark chocolate dessert that was 'dark enough' yet still fluffy and light. Fluffy Tofu. Silken tofu adds a nice fluffiness to pudding pies. But if you don't want a 'fluffy' bite, substitute vegan cream cheese for the tofu. Or you can even blend an extra handful of raw cashews in place of the tofu. Both cashews and tofu are texture builders for vegan pies. But, I adore the souffle-like quality the healthy silken tofu gives this pie. Heat. Blend. Pour. Bake. This is a pretty simple pie to whip up in a under an hour (and that includes the cooking time). With a base of simple vegan chocolate pudding, you can add your own flavor accents like cinnamon or espresso, texture enhancers like cashews, and even add-ins like melted chocolate for a richness to satisfy even the deepest of chocolate cravings. Rice whip on top is the perfect touch to this decadent chocolate dessert. 1. Heat the soy milk, salt, sugar, pudding mix, arrowroot powder, vanilla extract, cinnamon and cocoa powder over stove. 2. Stir mixture constantly until it bubbles and thickens. 3. Add silken tofu. Continue stirring. your mixture will be quite lumpy now. 4. Crumble in your chocolate bar. Remember to reserve a few chunks for garnish. 5. Stir until the chocolate has melted into the mixture. Remove from heat. 6. carefully transfer mixture to a high speed blender. Add in the espresso and cashews. Blend until perfectly smooth. 7. 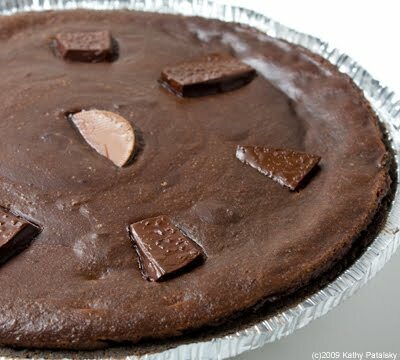 Pour mixture into your chocolate pie shell. Decorate with your chocolate chunk garnish. 9. Chill in the fridge for at least 3 hours. Serve with a swirl of cool creamy rice whip on top. *If you don't have a Wholly Wholesome pie crust, you can crumble vegan chocolate cookies or grahams into a pie dish. Use a food processor to crunch your crackers/cookies to get that smooth crust crunch. *If you want a more decadent pie, replace half the soy milk with soy creamer. 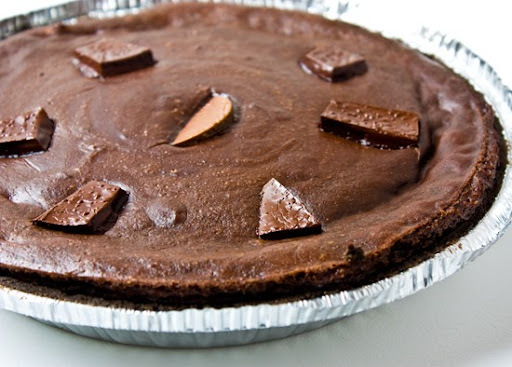 *If you want a lighter pie, remove the melted chocolate and add another scoop of cocoa powder. *Smores pie-add in a few vegan marshmallows before baking, smush them into the pie filling. 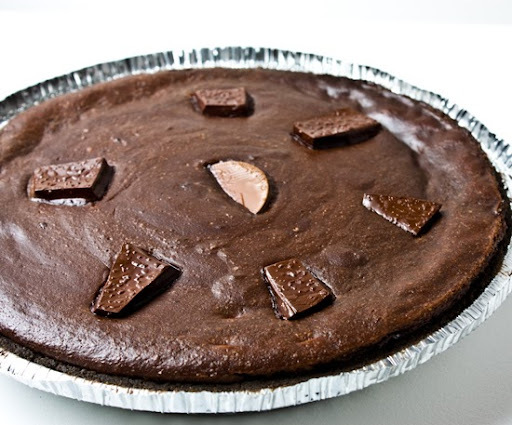 *Spicy Cocoa Pie- add in some cayenne for a spicy kick to your choco pie. *Hemp milk instead of soy will create a unique choco-hemp pie. *Swirl in some almond or peanut butter for a nutty twist. *For a no bake pie, remove the tofu, add another Tbsp of arrowroot powder, reduce the milk by a 1/4 cup, and simply stick the pie in the fridge to firm up after your stovetop cooking and blender blending.